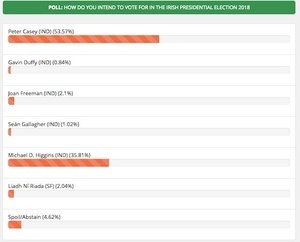 Readers of Iconic Newspapers websites, which include the Limerick Leader, have voted overwhelmingly in favour of Peter Casey in a Presidential Election Poll that has been running over the past few days. Websites in the group include: limerickleader.ie; kilkennypeople.ie; leinsterexpress.ie; offalyexpress.ie; leinsterleader.ie; longfordleader.ie; leitrimobserver.ie; donegaldemocrat.ie; tipperarystar.ie; nationalist.ie; dundalkdemocrat.ie; carlowlive.ie and waterfordlive.ie. 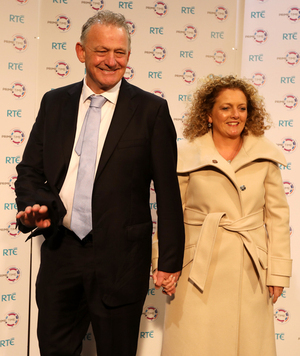 Almost 10,500 votes were cast in the Presidential Election poll that ran on all 13 websites, including the Leader, in the Iconic Newspaper group, with Peter Casey winning the overall poll with 51.2% of the votes cast. 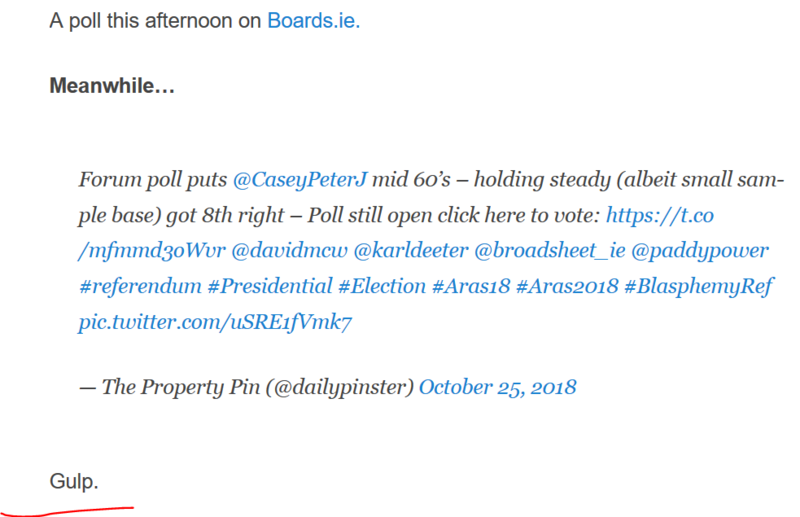 A poll this afternoon on Boards.ie. Via The Property Pin website. Current odds at Paddy Power. 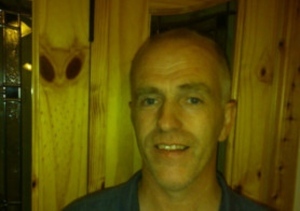 Posted in Misc and tagged Limerick Leader, Peter Casey at 4:56 pm on October 25, 2018 by Bodger. Online polls are worthless. What at the actual polls saying? There has been no ‘official ‘ poll that represents the people’s view since Casey’s truthful statements about travellers. How convenient (convenient when I consider almost everyone I meet and chat with are voting Casey 1 that includes people that were going to vote for Higgins. Sean oRourke was peddling that number even this morning! Nobody is surprised that’s the kind of crowd you socialise with Baz. Ye know. Idiots. Slurs and personal insults? That’s your best? Well it got Casey this far so…. That’s it fellas, lets ignore the majority of voters (those idiots), it’s worked well for Trump and Brexit. No votes have actually been cast yet jeffy, but don’t let the truth get in the way of your rant. Crikey. Lemmie guess…. you’re the kinda guy that shoots from the hip and sez it like it is…. And you hate the ‘tinkers’…. amirite? … and fish don’t have a word for water. Well what on earth could make you want to vote for that incoherent, bumbling hate-filled gombeenman…. jaysus baz you’ll be sending pipebombs through the post next. Nie możemy głosować na prezydenta Irlandii!! The frightening thing is that this is possible. They love him over on the Journal and facebook shows a fair bit of support as well. All made possible by useful idiots gobbling up the ‘snout in the trough’, ‘gravy train’ invented narrative. I overhead a conversation when I arrived at work today, all very favourable of Casey. If he had come out with his one-liners a week previously we might be having a serious conversation about this chancer becoming president. As it is, I’m wondering if he might force a couple of extra rounds in the count at least. He might get 200K back! “saying what we’re all thinking but afraid to say” because our bigoted hatred is socially unacceptable. We sent Dustin to the Eurovision. Big kick in the teeth for RTE. Maybe RTE will get another kicking on this. I just hope that the Russians don’t care who our president is. It would show a woeful misunderstanding of how our political system works. Hilarious! Pays no tax in Ireland and thinks MDH was president when the British Queen was here but he blew the “travellers, eh?” dog whistle and the idiots came a running. There’s a good quarter of the country who are anti-traveller / anti-welfare/ pro-Trump/ anti-feminist / anti-immigrant etc. but whether they leave their golf clubs/ brothels to vote is another matter. Casey has successfully tapped into the Fine Gael vote in a way that Gavin Duffy has failed to do. Interesting that the FG vote = anti-traveller / anti-welfare/ pro-Trump/ anti-feminist / anti-immigrant. Is there anything that FG doesn’t get blamed for here? I’m pretty sure it is FG that keeps p|ssing on the toilet seat in work, too. So you DO work for FG!!??!! Indeed – of course, at FG HQ, we actually have a flunky to disinfect the toilet seat with Chanel No.5 between each movement. That must sting with the scabbby áras on you…ouch! Scabs like y o u w o u l d n o t b e l i e v e Boj – you wouldn’t ever ask your wife to trim her fingernails a bit, would you? They’re always leaving old sandwiches and lunchboxes in the fridge at work too. And they sold all the toilet paper to their banker and vulture fund buddies who are now charging us 3 times the cost through a dobby company and not paying a penny of tax on it! You know when you’ve a fierce hangover and you go to the shop and they’ve no cans of coke left? he’s the only one of them telling it like it is. Those who like him for “telling it like it is” are such big fans of straight talking until they are told they are useful idiots or racists. Enlighten us then Doc, what would you call Peter Casey’s comments on the travelling community? Except they weren’t true were they? When Peter Casey said that travellers were “basically people camping on someone else’s land” he was tarring an entire community with his big bigoted brush. No doubt there are people that agreed with him and we call those people bigots. He also made remarks about them not paying their fair share of taxes while not paying any taxes to the state he wants to represent but that speaks more to his sense of entitlement than his bigotry. He is “telling it like it is”. The topics on which he is expressing an opinion are largely irrelevant for the office and as you say, straight talking is also not a requirement. However, many people don’t like how he’s being vilified for expressing perfectly valid opinions. The vote no longer has anything to do with the presidency. note “useful” – thats a step up from a straight idiot now isn’t it? The GRU visited Limerick? Posing as what? All that tells us is that a 900 users of a website that tends to be quite anti-traveller, and is a bit more right-wing than the general population, prefer Casey to Higgins. I’m not sure boards is more right wing than the gen pop, I’d say its fairly representative no? Gone be the days when it was a glorious haven of like minded geeks though. No, definitely a bit more small-government than the Irish population generally, if the Margaret Cash thread(s) are anything to go by. The After Hours threads on Boards are certainly more right-wing and less intelligent than is the norm in Ireland. Time for an honest speaker to shake it up. Prepare to be called names ollie. The bubble doesn’t like it. The bubble will retaliate. You must agree with the bubble. I haven’t called anyone racist or bigots. I’ve called them Idiots. Which they continue to prove to be. I’ve often found it easy to disagree with Rotide with some of his fast and loose remarks but in this case he’s showing a sheer amount of restraint and is not going far enough..
You lot, especially Baz, who are promoting Casey are not just idiots, you are the deluded, ignorant, majority that gets manipulated by the very same system you think you are fighting against. The 1st class eejits who will accelerate the wave of right wing extremism coerced, engineered and encouraged to spread across the world by global corporate private finance interests. Vote for whoever you like but stop promoting racism, bigotry and ignorance as being something to aspire to. casey’s odds via paddy power have gone from 500/1 when he first got on the ballot to 200/1 six days ago, 20/1 yesterday and 10/1 today. MDH is 1/25. This is likely due to a combination of (i) a slight bump in the polls (which he did get, no doubt); and (ii) if even a small number of people started putting bets on Casey in view of his being in the news recently, PP would be looking to reduce their exposure in the event that he did win. They still reckon that MDH is about 250 times more likely to win than Casey, to put it in its proper context. Nice bit of cash for you Brother if he wins. You could buy yourself a new driveway. I don’t approve of betting. I do, however, heartily approve of spending cash unwisely. The havana bat-Cheek of you. You should lay him off immediately in the exchanges, if he is at 10/1 you could lay him at 12’s and make a cool 200 quid. If he does win you make nothing. (not that it matters a lot at those potential returns) but did u do a spread across all the candidates BB? It was the tweet that caused RTÉ the libel case, but from my recollection of the night, it was Martin McGuinness uttering the word ‘envelope’ that was the real show-stopper; I’d say that that had more of an effect on voters than a tweet being read out. What’s amazing to me is how low the SF vote is. The posters are plastered everywhere around Dublin. Not to mention the battle bus etc. Higher than FG and FF combined,who between them could not find a clean candidate.Instead their x leader attends book launches by journalists,further confirming a sinister,insidious relationship.For a devoted and life long socialist,Mickey D has embraced the Americanization of Irish politics by cozying up to everything,he supposedly wasted his life and career fighting. Liadh has run a terrific campaign and will surprise many people. regarding her I do remember going back to the period when she was rumoured to be the SF candidate, little reported at time, going onto Marian & being fairly snidely hammered on the usual tired rote shite but putting herself very well into her box, waay too strong for her. Always good to hear Marian getting clipped by a stronger interviewee. anyways I’m guessing she might have a good shout of finishing 3rd. I think this is a interesting case of people’s consumption of media confirming their own biases: when I listened to the Marian interview, I heard her unable to answer some fairly simple questions on SF’s policy of organising parallel commemorations to those of the state. SF orgainising fundraisers in America for their own coffers == good. 5 hour time difference making it quite early here, coffee,NYT,WSJ,WaPo ==good start to day. Arguing with Rob over nonsense ==bad start. If Soros/the duty free guy who also never paid a cent in tax-Atlantic ABC-wants help society then instead trying cleanse that money with good works, pay tax.Speaking of which when’s FG’s favorite convicted criminal,Lowry back in court ? I actually agree with you on Soros money thing, johnny- I don’t think that it’s appropriate for money from outside Ireland being spent to influence democratic votes. But then position seems a bit consistent, given that you oppose one such instance, but actively support a different instance of this happening. I don’t get it . He sounds stupid. I left school at sixteen but I can always spot a stupid person . If ireland voted him in you may as well get rid of the president. Broadsheet not even hiding their bias this time round. Democracy is great unless we don’t like the outcome eh lads? The thing we should be voting on is the maximum permissable budget of discretionary spending in the áras. Solve most of the issues right there, including who wants the job in the first place. Don’t forget the pension. My god those pensions. Whatever gave you the idea that Broadsheet wasn’t biased? It is and always has been left leaning. That said, I’m not sure how reporting on a couple of surprising polls is particularly biased. The biased bit was wher they wrote “Gulp” at the end. You wouldn’t know that now because they edited it out; which is par for the course whenever I call them out on this kind of thing. FWIW I’m left wing, which means I’m for wealth redistribution, not champagne socialism. I’m not voting for Casey. I don’t “support” him either. Try to remember your’e not on 4chan ok? Commentator proves his point with evidence. Giggidygoo throws a hissy fit. If the boggers vote him in then us dubs should have their own little bogexit. Yar, SHUT yer trap Leo! snigger. Wouldn’t it be appalling if someone was democratically elected because he or she spoke for the masses and not the Right On, PC brigade? Holding a condescending attitude towards people voting for Casey is probably only going to make them more determined to go out and vote for him. I would be surprised if Casey sets up an extreme right-wing party after this election, given of course, that he doesn’t win. Cos the National Party and Renua are so popular that there’s room for a third one! mince your own lamb yeah? Wee Mickey’s retirement jaunts to far flung socialist places that most of us have never heard while people are dying on the streets of our cities?. Go fluck yourself ! What happens if Casey wins despite his wish not to do so? Very Trump. If Casey wins, he’ll have to be resident in Ireland and pay tax here. He’ll spend the next 7 years jaunting around on the lear jet, staying in 5 star hotels, and spending €300k on dry cleaning and make up. I feel the real reason Casey is winning these polls is because he comes across as a normal person. A normal person who, albeit has done extraordinarily well for himself. None worse than loveable poet Micheal d Higgins a pompous, aggrandising, self entitled profiteer. He comes across as a rambling moron. In all fairness, Facebook, The Journal.ie, boards.ie, and the Limerick Leader and confederates are not actually hotbeds of intellectual, rational decisions, or MENSA candidates. Look elsewhere. 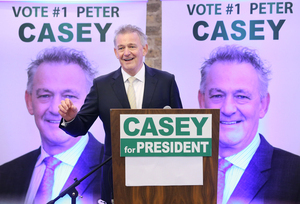 Casey will undoubtedly come in second, and do very well from Dun Laoghaire and Meath FG brigade and over 65s. Or as we call them, “racist, spoiled, right-wing, Trump/May sneaking regarders and ministers of the eucharist”. The #hometovote crowd will regret sitting this one out.